When it comes to improving product visibility on Amazon, it’s important to understand that customers have different search habits on Amazon compared to Google. On Amazon, a customer can only find your product if the customer’s search inquiry is matched (via Amazon’s A9 algorithm) to one of your product keywords. This means if you’re relying on Google AdWords data for your keyword research, you risk building inaccurate keyword lists that are simply not relevant to the search queries of Amazon customers. At Sellics we’ve written a comprehensive guide to help our sellers master Amazon SEO, and learn to continually improve their product’s organic rankings on Amazon. Performance: A product with a strong sales history will rank higher in Amazon’s search results. Relevance: How well your product (via your chosen keywords) matches the search queries of the Amazon customer. Given that most customers do not even look past pages 1-3 of search results on Amazon, it’s imperative that you are continually tracking & optimizing your keyword rankings to improve your product visibility on Amazon. Keywords are the main driver for your product’s visibility in Amazon’s search results. Your goal is to research as many relevant keywords as possible that could potentially match the search queries of the customer. If you forget to include a relevant keyword, you risk your product not showing up at all in Amazon’s search results for that customer search query. On Amazon, customers expect to find exactly what they’re looking for quickly – which means many customers tend to be more detailed about what they’re searching for from the start. These longer customer search queries are called “long tail keywords” — in fact, over 70% of customer searches are long tail. You can use Sonar, our free Amazon keyword research tool, which will pull keywords directly from the real customer search terms used by Amazon shoppers. Sonar’s internal algorithm only looks at Amazon data, meaning sellers minimize the risk of bidding on potentially irrelevant keywords. Importantly, with Sonar you can sort keywords by search volume, allowing you to identify the most relevant keywords for your product. Product title: The most relevant keywords for your product will go here. Seller Central backend search terms: Further keywords can be placed here. Make sure you don’t exceed 250 bytes of keywords to comply with Amazon’s new 250 bytes restriction. Bullet points + product description: Any further relevant keywords that did not fit into title and backend keywords can be placed here. However, make sure it doesn’t disturb your content and conversion rate. Amazon is aware of shopper behavior and has taken this into account in its algorithm. 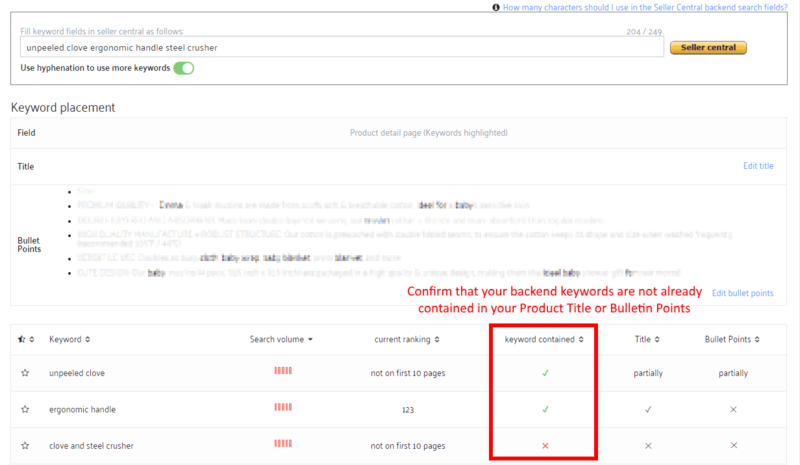 Keywords featured in the product title have the greatest weight for the ranking, followed by Seller Central backend search terms, and bullet points + product listing description. Tip: Use Sellics to optimize all your product listings and monitor your keyword rankings. Immediately see which product listings need improvement, and use our Sonar-powered keyword recommendations to optimize your listing pages. Seller Central backend search terms are very useful to help you include all the keywords that are relevant but didn’t quite fit in the title or bullet points. This is also a good place to put keyword variations that aren’t suitable for visible integration, like colloquial synonyms or common misspellings of certain keywords. Amazon treats the whole field as a coherent set of keywords, so keyword location or relative distance of keywords from one another is irrelevant here. To cover different combinations of keywords (e.g. “cream face” and “cream eyes”), it’s not necessary to repeat any keywords. 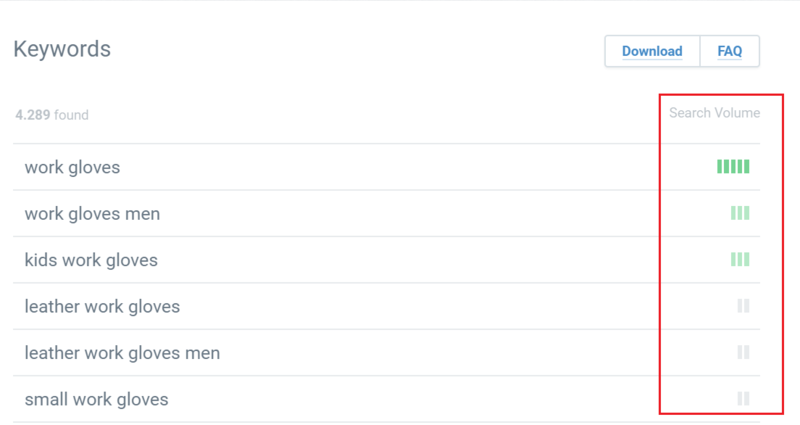 Therefore, you should aim to enter as many unique keywords per field as you can. Please note that as of August 2018, Amazon is only indexing 249 bytes in the backend search fields. Characters that exceed the limit prescribed by Amazon will not be indexed. Additionally, spaces, commas, and hyphens are now included in the character count. In general, the higher the click-through-rate (CTR) and conversion rate (CR) for a certain keyword, the higher your product will be ranked in search results for that keyword. When it comes to improving your CTR & conversion rate, there are several factors to take into consideration, including your product title, image, whether you offer Prime shipping, and customer reviews. Your conversion rate is calculated on an individual keyword basis. It is calculated by dividing the number of customers who made a purchase against the number of customers who visited your listing page. Amazon wants customers to find their desired products quickly, meaning the A9 algorithm will rank products higher for keywords with a high conversion rate. Product images play an important deciding factor in both your CTR and CR. Once the customer has landed on your product listing page, images are a huge influence on the decision to buy, because customers want to have a sense that they know exactly what they are buying. They want to see the product from all angles, be able to zoom in, and even see the product being used/worn depending on your product uses. 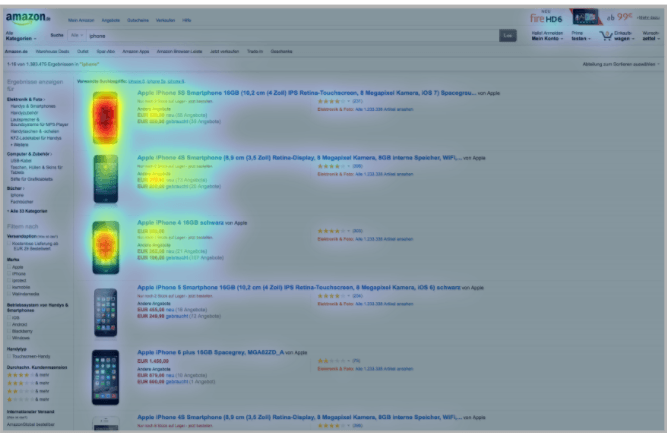 The heatmap picture below highlights the important factors affecting your CTR. As you can see, many Amazon customers will look first to the image and product title, and you will want to optimize your listing page in line with this customer behavior. You can also read our article ‘Complete Guide to Product Image Optimization on Amazon’, for further guidance. Customers reviews have a huge influencing factor on the conversion rate, which makes them a critical part of Amazon SEO. Products that have good ratings (generally 4 stars or higher) are more likely to make it to the top of Amazon’s search results. It’s very likely that a customer will browse through your reviews before deciding to purchase, and if a handful of customers have left negative reviews, then the shopper will be inclined to click away, and thus lowering your conversion rate. Offer a refund for defect / broken products, or send a new one. Let the customer know that the product review shouldn’t include feedback from shipping if you’re using FBA. Correct the customer for using the product in the wrong way, if that was the case (for example, not following the washing instructions) and add those instructions for use to your product listing text. Responding to negative reviews demonstrates to your potential customers that you care about customer satisfaction. Amazon will consider your sales figures as a performance indicator when ranking products. The more frequently your product is sold, the more likely other customers will purchase the same item, and the more likely Amazon will push your product higher in search results. This is why top-selling products on Amazon rank higher; higher-ranked products sell better, and higher sales figures will keep the product ranking higher in search results. But how can I kickstart sales for a new product? For many sellers, optimizing for Amazon SEO alone will not be enough to kickstart sales for a new product. You will also want to consider running promotional giveaways, bolstering sales with discounts, and running Amazon PPC to help drive initial sales momentum for your new product. For sellers new to Amazon PPC, you can read our Amazon PPC Manual for a step-by-step guide on how to set up your first PPC campaign.